All along the Western Front the Germans curse them “Verdamnt Der Rot Falker!” They were Barry Rand, Yank ace and his giant Senagalese aide, Sika. Their blood-red ship was a patched-up crate of salvaged wreckage–their drome a hidden tarmac in the Vosges Mountains. Yet from Paris to Berlin they were known as the most deadly pair of hellcats that ever blazed a death trail through Boche skies! 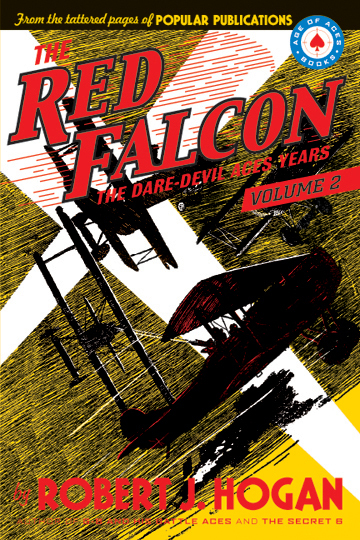 This exciting second volume of the collected adventures of The Red Falcon by Robert J. Hogan includes five more gripping air-war tales from 1933 including “The Invisible Patrol” with guest appearances by Hogan’s Smoke Wade and Harold F. Cruickshank’s Sky Devil! Also included is an in-depth look at the life and art of Popular Publication’s master aviation artist, Fredrick Blakeslee by David Saunders.